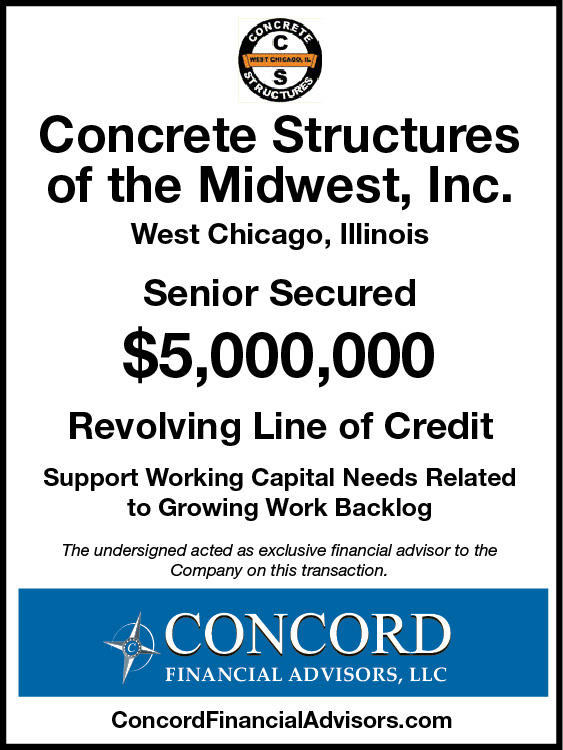 Concord Financial Advisors, LLC announces the closing of a $5,000,000 Senior Secured Revolving Line of Credit for Concrete Structures of the Midwest, Inc. (“Company”) located in West Chicago, IL. The Company specializes in cast-in-place concrete construction and design for airport runways, highways, high-rise buildings, specialty flooring, etc. Concord created a detailed memorandum featuring the Company’s leading industry position, strong ownership / management team and increased market share. Concord drew on its team’s 100+ years of experience to identify multiple bank and non-bank financial institutions that were comfortable with the industry. After conducting a targeted search process that generated multiple Proposals, Concord secured an attractive loan structure from a local bank that met all of the Company’s financing objectives.